Difference between revisions of "Krdc"
[[Krdc]] is one of a pair of KDE programs - '''[[Krfb]]''' is the other - that let you share your desktop through the local network with another user, probably somebody like the tech downstairs who you want to help you. Sharing your desktop can let her help you figure out something you are having trouble with. You can call the tech on the phone and be talking with her while she assists you. The tech can even "drive" your computer if you decide to let that happen. 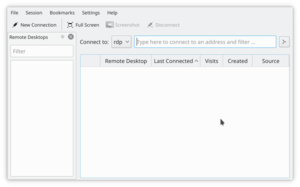 '''Krdc''' is one of a pair of KDE programs - [[Special:myLanguage/Krfb|Krfb]] is the other - that let you share your desktop through the local network with another user, probably somebody like the tech downstairs who you want to help you. Sharing your desktop can let her help you figure out something you are having trouble with. You can call the tech on the phone and be talking with her while she assists you. The tech can even "drive" your computer if you decide to let that happen. You will also need to refer to the [http://userbase.kde.org/Krfb Krfb Page] to make complete sense of the '''Krfb'''/'''Krdc''' process. You will also need to refer to the [[Special:myLanguage/Krfb|Krfb]] page to make complete sense of the '''Krfb'''/'''Krdc''' process. :*Find out the screen resolution of your guest computer. :**Two boxes will appear for '''Width''' and '''Height'''; enter the resolution from your guest computer's desktop. Click '''OK''' and you are set. Connect and the host desktop will fit your guest desktop fully in full screen mode.